Every year we look for the best and tastiest Easter treats. This year more than ever as I am pregnant and craving sweets! I have searched high and low for some of the best treats out there! Geoff and Drew's came to the rescue! They have the most amazing boxes stuffed full of gourmet brownies and gourmet cookies. We tried the Yellow Celebration Box packed full of cookie and brownie goodness! The Yellow Celebration box is really perfect for any occasion you plan to celebrate especially Easter with the bright yellow and colored dots on the package it makes a great addition to any Easter basket or a wonderful stand alone gift. The Yellow Celebration box comes in a variety of choices ours was the 5 brownies and 5 cookies pckage but you can also get only cookies in sizes starting at 10 up to 18 or only brownies starting with 8 up to 18. If you are looking for variety you can choose the 5 cookies and 5 brownies like we did and get a mix of each of their cookie and brownie varities. These also come in larger sizes with different brownie and cookie combinations. 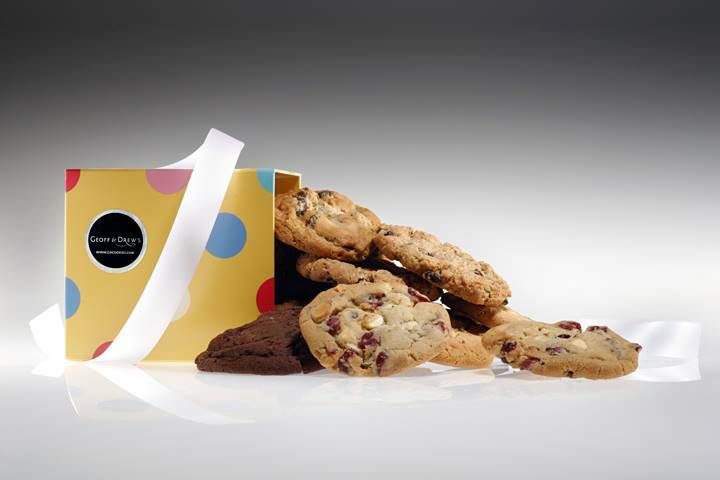 Some of their cookie varieties include chocolate chunk, double fudge, oatmeal raisn, ginger snap, toffee chocolate and white chocolate cranberry. The white chocolate cranberry was my favorite. I am a huge white chocolate lover and the added cranberry touch was amazing. Their brownie varities include chocolate chunk, toffee, peanut butter and mint chocolate chip. My favorite in the brownies was the peanut butter brownies. I am usually not a huge fan of peanut butter but these were perfect. My favorite would be chocolate chunk and the brownies sound amazing these also look like the perfect gift for my family and friends especially for Easter I love the yellow celebration box it's very chic I am so happy to have seen this thanks for the info! I would go for the super- rich brownies. Walnut brownies are my favorite. My favorite cookie is sugar cookies! I love rich moist fudge brownies with pecans in them. For cookies and brownies, I do like any with dark chocolate in it. I am also a fan of vanilla flavored cookies.